The Strategic Sales Competition hosted by the Department of Marketing continued to set new records in its fourth year with 39 students, 30 judges and four buyers from 22 different companies participating. 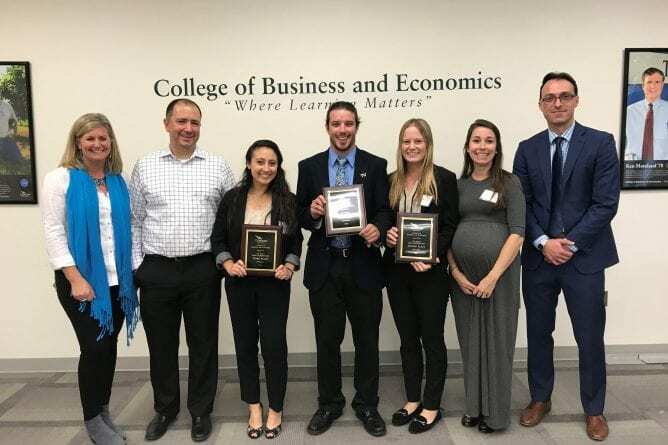 College of Business and Economics students Dean Dugan, LeeAnn Goodrich and Jordan Arian-Nejad placed first, second and third, respectively. All three are business administration/marketing majors. The top five students will travel to Atlanta, Ga., this coming spring to represent Towson University at the 2019 National Collegiate Sales Competition at Kennesaw State University. The competition scenario, provided by platinum sponsor, McCormick & Co., put students in the role of a McCormick sales rep tasked with selling Frank’s Red Hot sauce and other condiments to a fictional local restaurant chain. Volunteer business professionals played the role of the buyer, the restaurant chain’s vice president of operations, and were given specific issues and objections to raise. Students had 20 minutes to conduct their mock sales meetings. Judges scored students on their delivery, poise, and how they overcame objections via a live streamed video of the sales interaction. First-place winner Dugan, who has experience in sales jobs, said the competition reinforced his interest in sales and gave him a value networking and learning opportunity.